In this lesson we will see how to write a custom function that builds a string by repeating a given string a certain number of times. We are going to write the function repeatedString(pBaseString, pRepeatCount), the function concatenates the pBaseString parameter as many times as specified by pRepeatCount to build a long repeated string. It does this by using a repeat loop to build the string, appending the string to the return value as many times as needed. The function will be called with a statement such as one of the following. 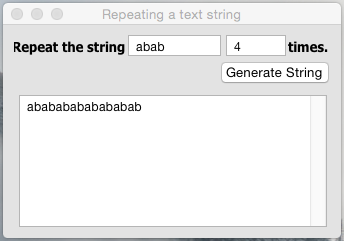 put repeatedString("abc",2) into myString -- returns "abcabc"
get repeatedString("A") -- returns "A"
We will create an example stack which will allow us to specify the parameters, call the function and display the result. We use the after keyword to build the final string. We have chosen to use the put...after form of the put command to build the string because, in general, the put...after form is faster than the put...before form or using the & or && operators. If you are dealing with fairly short strings and a fairly low number of repetitions--under a hundred--the time savings may not be significant, but when building a repeated string with thousands or tens of thousands of repetitions, using the put...after form may save as much as several seconds. The time difference becomes even more pronounced the longer the string becomes. Now all we need to do is call the function from the Generate String button and put the result into the result field. 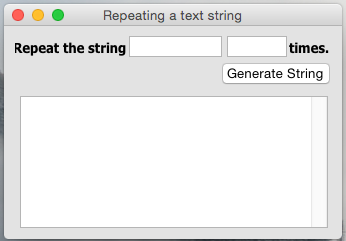 put repeatedString(tBaseString, tRepeatCount) into field "result"